Scoot off to Singapore! And go la, to Geylang! Yes, I’ve succumbed to the temptations of the newest budget airline and am scooting off to Singapore…even though I just spent a few days there in late April. Why? One-way fares of $121 for Sydney to Singapore are pretty hard to beat. If you’re in Australia you should really check it out! From there I’ll be taking local flights to get around, and am planning to spend a few days on the lovely Tioman Island before flying to Kuala Lumpur with Air Asia for some great eating and shopping. Last time in Singapore I stayed in Clarke Quay, especially fun on a Wednesday night which is ladies night (more on that in a later post). But where to stay this time? I’ll be travelling sans husband, and looking to downgrade from the Swissotel Merchant Court at which we stayed last time. I’m thinking of heading northeast. In previous trips I’ve seen all the city sights, I’ve discovered the (touristy!) delights of Chinatown, Little India, Kampong Glam, Marina Bay and Bugis area. In April I decided I wanted something a little more exotic, yet still able to be done in an afternoon. What next? Fascinated by both Malay and Peranakan culture, my researches led me to Geylang Serai, a predominantly Malay area with great hawker food and Joo Chiat, home to old Peranakan style shophouses (a la Penang). The shophouses stretch all the way down Geylang Road, where the area becomes known simply as Geylang – Singapore’s Red Light District. Oo er missus! This place was looking juicier by the day. Never heard of them? They are well worth checking out (and see the map here to get your bearings). Geylang/Joo Chiat, while not as close to the city as Chinatown & Little India, is nevertheless quite easy to reach by MRT. I changed twice to get to the closest station Paya Lebar, which takes around 30-45 minutes. From THERE it’s just a moderate walk…but it wasn’t for me on MY first visit (see full sob story below). So, what is there to see? 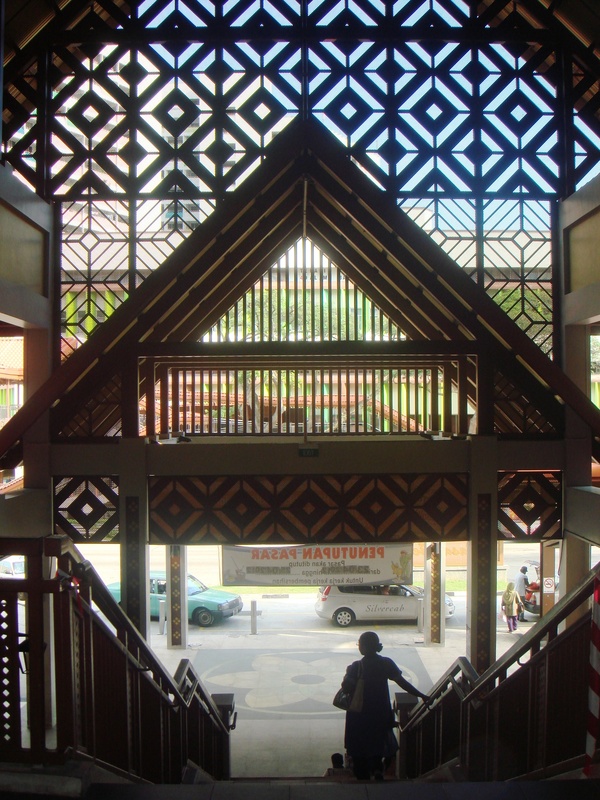 Up until late 2011, there was a Malay Village eponymously titled Geylang Serai, which housed replicas of Malay kampong houses and aimed to preserve Malay culture and promote tourism. Alas, the 10 million spent was never recouped, and the village closed late September last year. I highly recommend the Remembering Singapore post on Geylang Serai for more background on this. In its place a new Civic centre is being built, to be completed around 2016. Blooming amidst the ubiquitous high-rise complexes here is a fantastic Malay Hawker Centre and clothing market (albeit catering to Muslims and predominantly carrying Baju Kurungs and headwear). 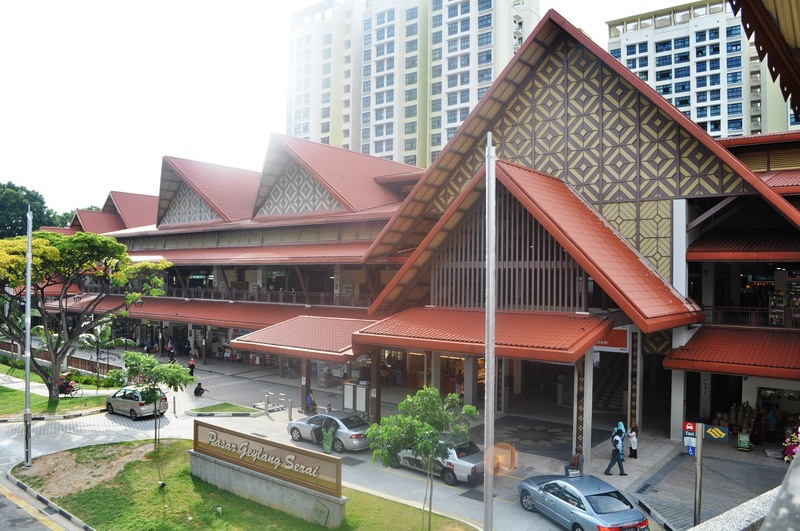 Known as Pasar Geylang Serai, it has the structure of a Malay longhouse, all A-framed gables with wide overhangs, embellished with traditional diamond design wooden panels, and incorporating decorative ventilation screens so the air can circulate and keep the place cool. There are beautiful batik motifs and intricate patterns adorning the walls, inlaid stone featuring floral motifs on the floors, and everywhere a sense of craftsmanship that is missing from modern malls. But enough about the architecture, right? On the ground floor is a series of stores ranged around the perimeter, with a wet m arket in the middle. 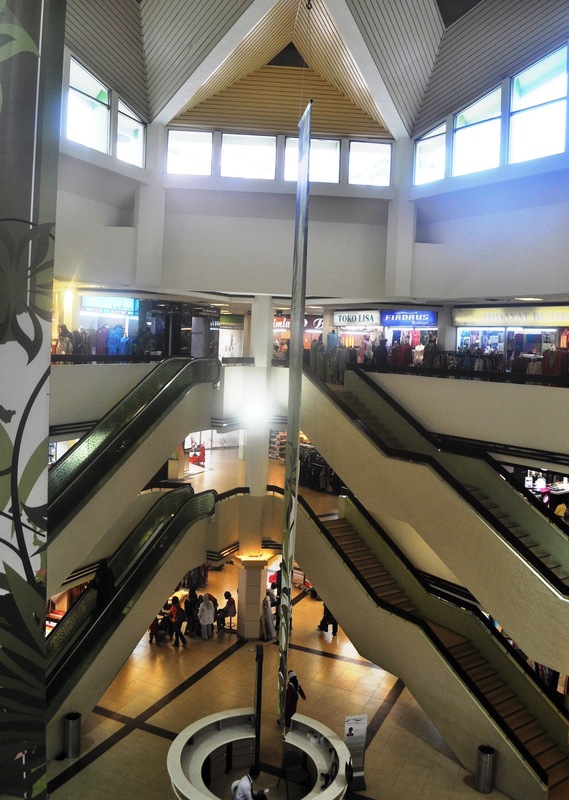 On the first floor, reached by stairs, lift or escalator, is the food centre. THIS is what you come for. Apologies for the bad quality of photos – not wanting to stand out, I snapped quickly with my little point-n-shoot. Note it was mid-afternoon, hence not too many people there post-lunch and pre-dinner. You may be able to see in my first photo a banner proclaiming healthier choices. 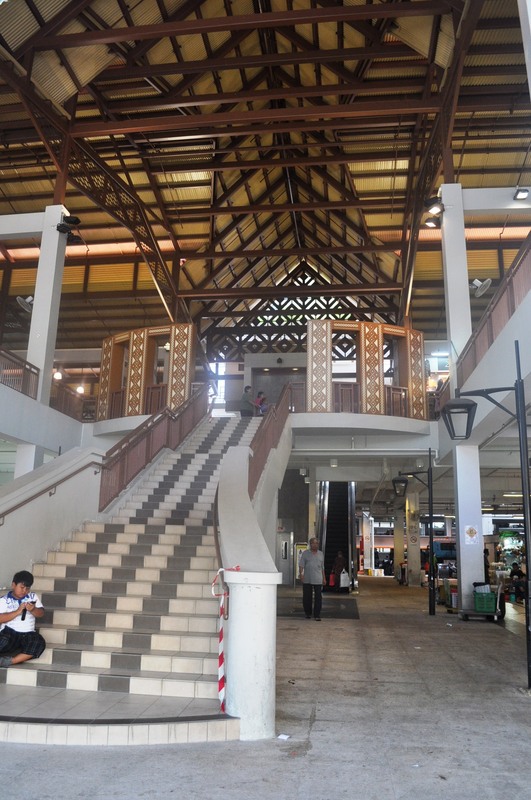 In late April when I was there, Peyar was one of 3 hawker centres to take up the challenge. Stalls in these hawker centres have started using whole-grain noodles, brown rice bee hoon, healthier oil and salt, and selling drinks with lower sugar content. Read more in the Straits Times article. Hajjah Mona Nasi Padang and Geylang Briyani Hall are some of the well-known stalls to try. Apparently at breakfast time, GS Oli Thosei & Food Stall is a great place to enjoy Appom (Indian rice dish), Dosa (Indian pancake) and Masala chicken (spiced chicken). Be sure to go early for these dishes often sell out before noon. As for me, I had limited time to spend there as I wanted to SHOP! 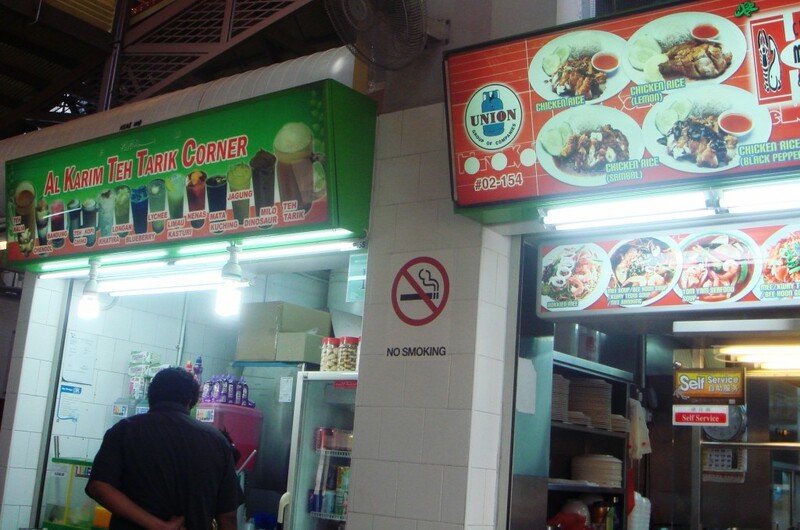 So I just grabbed a teh tarik from the Al Karim Teh Tarik Corner (above). Next time I would do the sensitive thing and cover up – at least wear short sleeves. As it was so humid, I was wearing a strappy tank top, and while no-one looked at me sideways, I felt people studiously NOT looking at me – know what I mean? Were I dressed appropriately, I think I would have talked to people aside from the stall owner, and likewise felt more comfortable taking photos. A word to the wise. 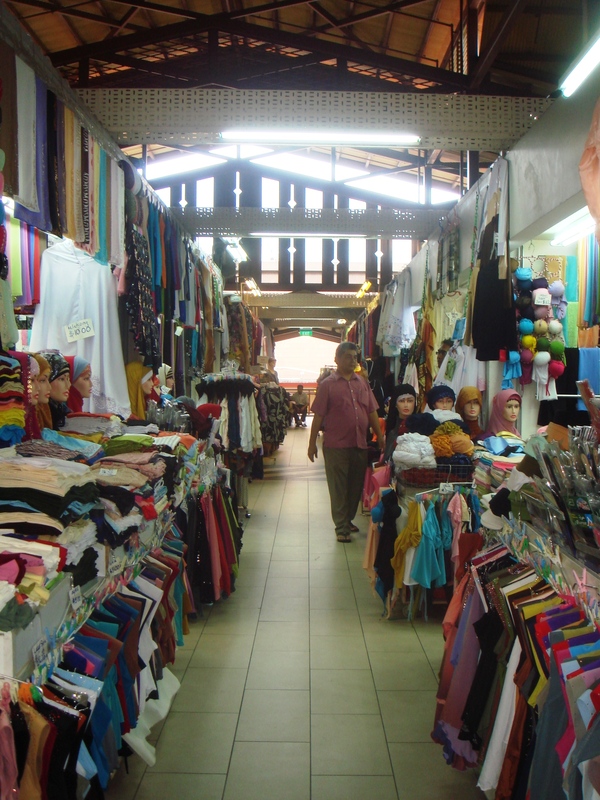 Next it was time to check out the cloth and clothing markets. There were quite a few ladies shopping here, although I avoided taking pictures of them so as not to offend. There were beautiful batik patterned pieces of cloth that one could buy to make up into skirts or pants later (and indeed I was wearing pants made of almost identical batik cloth). As I mentioned earlier, the main fashion favoured by Malay women is the Baju Kurung – a knee length tunic over a long sarong skirt, paired with a head scarf. While the purpose of the dress is to cover up, the colours are often joyfully bright, with detailed embroidery and silky lustre. I was fascinated and yet could only admire from afar. While tempted by the beauty of some of them, I could only make the pieces work separately back at home, and managed to resist buying any. You can also see here a lot of childrens clothing. Hey, if you don’t believe in contraception, then everyone’s got them, right? 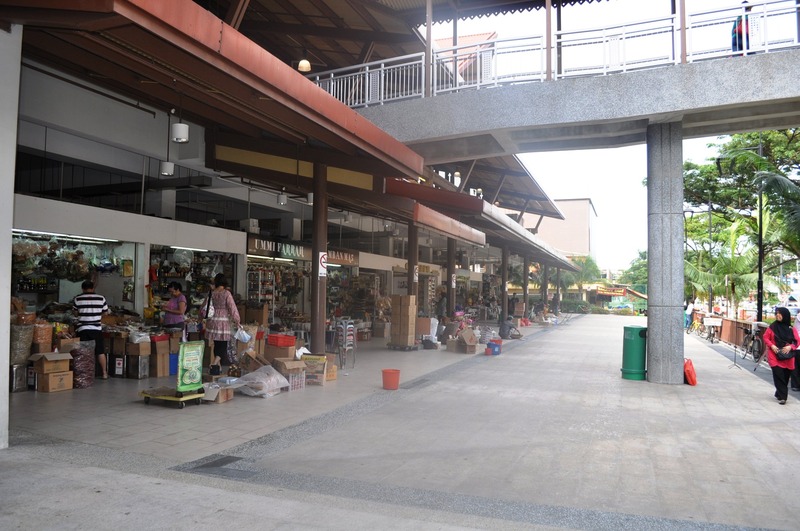 Pasar Geylang Serai has become a hub for not only Singaporean Malays, but also those of Malaysia, Brunei and Indonesia, serving as the ‘Malay Emporium of Singapore’. The Wisma Civic Centre when built, will no doubt become a place where Malays come together as a community, enjoying shared activities and celebrations. 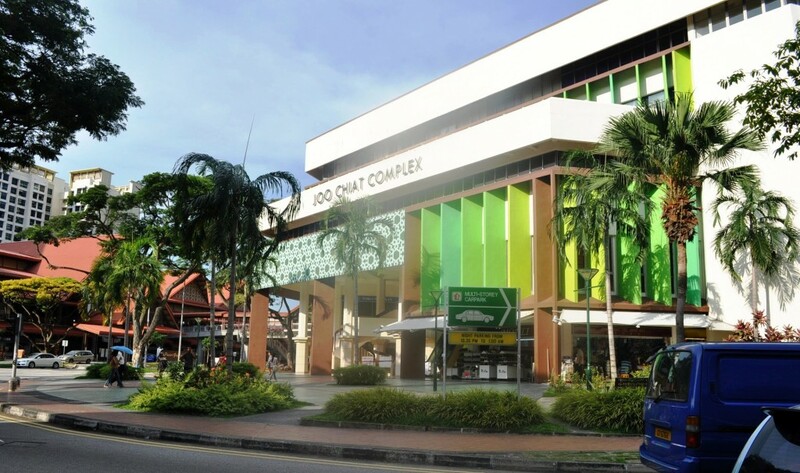 Just across the road from Pasar Geylang Sera is the Joo Chiat Complex – a multi-storied shopping mall again featuring a lot of clothing stores, but also fabric, curtain, carpet and other homewares stores. 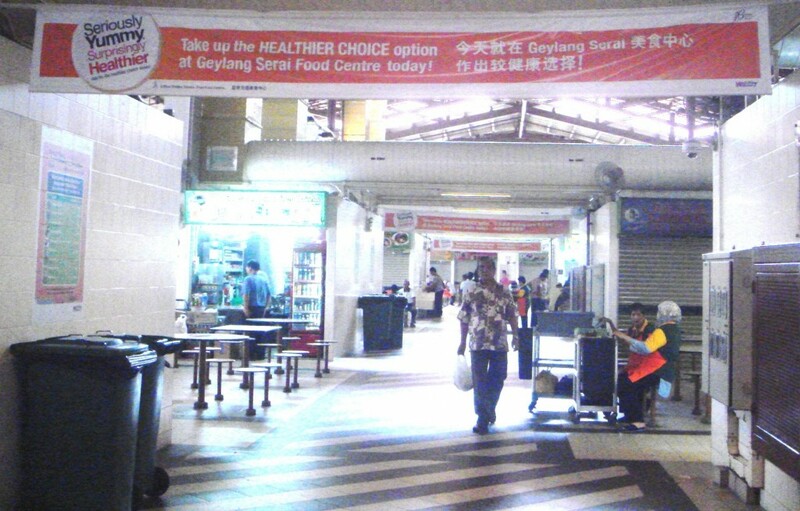 You don’t even have to cross the road – there is a covered walkway stretching from the first floor of the food centre across to Joo Chiat. Look at the outside – isn’t it a lovely festive building in thjose varying delicious shades of green? Inside too, is very modern with a soaring vaulted ceiling and open central area accentuating the height of the structure. I checked out a few of the stores, but realised quite quickly that there really wasn’t anything for me. (The question “why didn’t I go to Orchard Road?” did, I admit, rear its ugly head right about now. “But you’re here for CULTURAL reasons”, I admonished myself, while mentally slapping myself upside the head). To be fair, there were some shoe shops which were cheap and cheerful – just not to my taste. On the ground floor I nosed around the curtain stores for a bit, then headed outside to the adjacent building. Here there were interior designers, custom curtain makers and generally more desirable and upmarket things to buy. I was almost certainly going to purchase some very luxe-looking gunmetal-silver fabric with turquoise central asian motif embroidery (to match my new wallpaper). But then I looked at my watch. Oh my. I had less than an hour to find my way home to meet the boy and head out to Marina Bay Sands. Bugger. Why did I waste 45 minutes just GETTING to this place? So I left the store and decided to get a few snaps of the surrounding area on Joo Chiat Road. What beautifully restored shophouses there were! 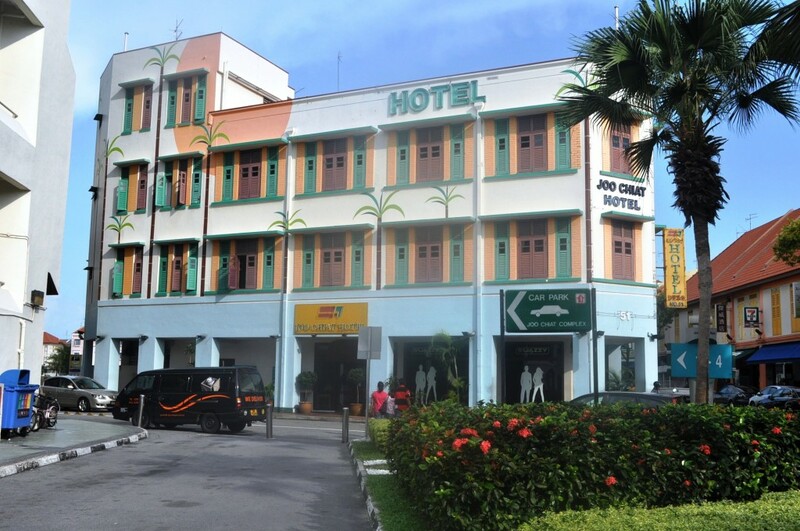 To the side of the Joo Chiat Complex was the Joo Chiat Hotel – similarly painted in bright pops of green with orange and brown thrown in for good measure. Looking down Joo Chiat Road I saw row after row of well maintained shophouses, and felt there was a very villagey atmosphere about the place. It just felt like a place I would like to spend more time in, even if I wasn’t a Malay or a muzzie. 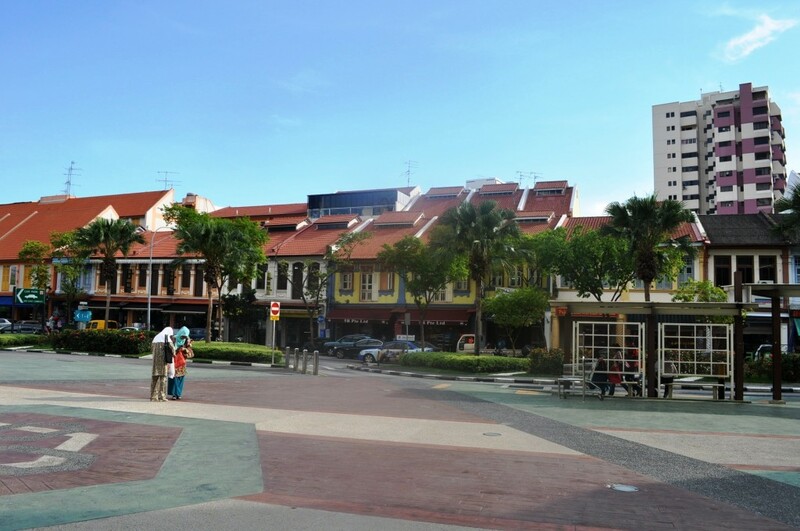 And so it comes as no surprise at all to read that Joo Chiat has become Singapore’s first Heritage Town. 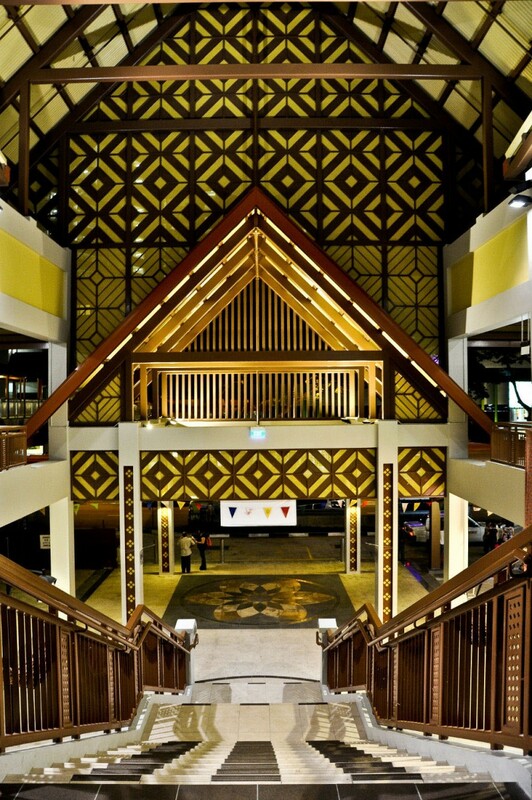 In fact, just a few days ago on Saturday 30th June the Joo Chiat Heritage Night was held to celebrate this victory in preserving Peranakan culture. 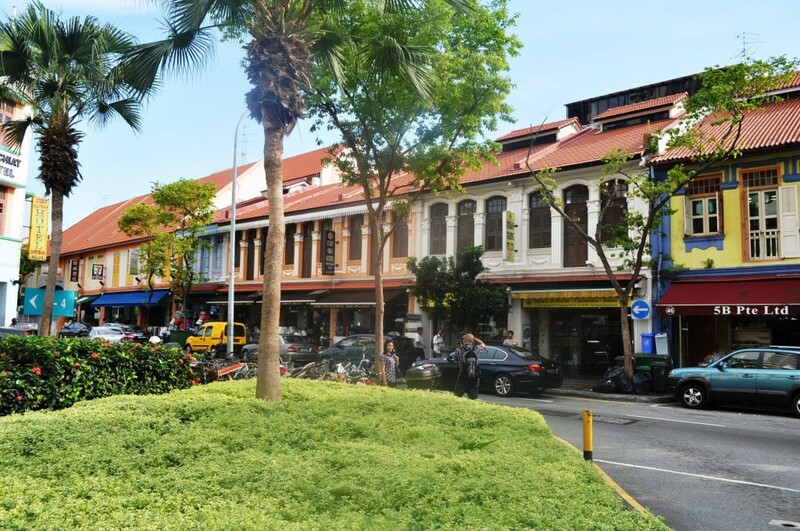 I won’t repeat it all here, but there are many great stories about the area’s past, and the original Joo Chiat’s great-grandson has a fantastic blog, My Choo Jiat Story – go have a read. With all this in mind, and searching for hotels for my upcoming trip, I noticed many cheaper options were in Geylang, just a tad further west of Joo Chiat. Not at all put off by the fact it’s a red-light district after dark, I’m keen to explore the many eateries and shophouses there. I haven’t shared much about Peranakan culture here, as I am quite the novice myself. Hopefully I’ll learn a lot more and have some good quality photos after this next trip. 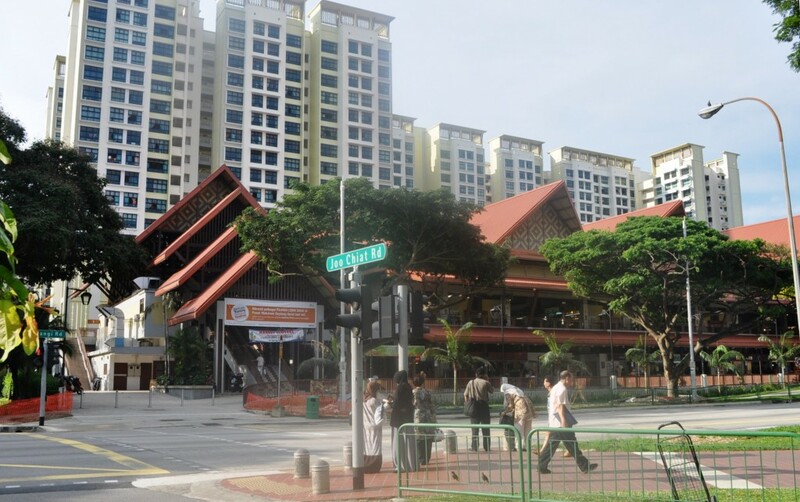 Having arrived at Paya Lebar station, it should have then been a moderate walk to the Joo Chiat complex/Gaylang Serai food centre – had I not listened to the advice of locals at the station. Wanting to check I was about to walk in the right direction, asked “is this the way to the Joo Chiat Complex? Various people told me it was too far to walk and I needed to get the bus, so I looked it up, and waited. We’d passed Joo Chiat Road or Joo Chiat Lane, which the driver thought I wanted, but were now nowhere near where I REALLY wanted to be. Doh. Off I jumped, walked a bit, clueless, then spied a hotel with a cab rank out the front. Joy! I only had the afternoon to explore and time was running out. Except there was already a queue, with people in front of me. I didn’t know this until I’d finished shopping, and asked locals how to get back to Paya Lebar MRT. It took about 10 minutes to walk it.